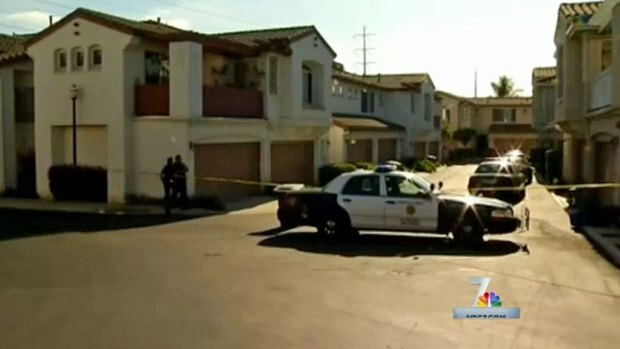 A 10-year-old boy has died after being shot while playing with a gun, according to San Diego police investigators. The boy and his 9-year-old friend found a 9 mm semi-automatic in the garage of a Miramar Ranch North home according to San Diego homicide detectives. It was around 4:15 p.m. when a neighbor heard a loud bang and then some screaming. A 10-year-old boy has died after being shot while playing with a gun, according to San Diego police investigators. NBC 7's Dave Summers spoke with residents who said it was common for the kids to bounce from one garage to the next. When the children starting holding the weapon, it discharged and struck the boy in the chest officials said. A neighbor ran to the home, began CPR and called 911. The boy was taken to Rady Children’s Hospital where he was pronounced dead. The tragedy has shaken many of the families living on Ivy Hill Drive. Neighbors of the community say it’s common for the children to play together, bouncing from one open garage to the next. “I just can’t believe it,” said resident Julie Choi whose two sons often played with the victim. She described the boy as a fourth grade student. A 10-year-old boy has died after being shot in the chest, according to officials at Rady Children's Hospital. Police said he and a 9-year-old neighbor were playing with a gun. NBC 7's Dave Summers reports. Choi saw the boy riding on his scooter outside her home moments before the shooting. “I was so shocked to listen to the news. I’m still so devastated,” she said. Estela Donadio’s daughter also plays with the children involved in Tuesday’s shooting. “We don’t know yet details if it was an accident or if it was playing but it’s very, very disturbing that adults will have guns at home at the reach of children,” Donadio said. “It’s very, very upsetting as a mother to hear that a young life is gone like that due to an accident perhaps." “A beautiful, little young life,” she said. The girl who witnessed the shooting was very shaken up but uninjured police said. She will be questioned about what happened in the moments leading up to the shooting. Carla Mangus said residents all keep their garages open and the complex is “like a big, huge playground” for the children. She now has the difficult task of explaining to her son why he will no longer have his playmate. Investigators said they are interviewing witnesses. Officials said as far as they know, there were no adults at the home at the time of the shooting. A teenage sister was upstairs in the condo. The adult residents connected to the garage were interviewed after the shooting. Pending results of their investigation, homicide detectives said it is possible both could face charges. “We’re going to have to investigate where the gun was and whether the child had immediate access to it or if they were digging around in an area where they wouldn’t expect for them to get to,” said SDPD Lt. Joseph Ramos. Ramos warned gun owners to “think like a child” when it comes to securing their weapons. “Because they are very curious and sometimes these tragedies happen,” Ramos said.